For those of us who live in climates where we have to endure a frigid winter, we’ve all woken up to a sheet of ice on our cars that must be tediously scraped off. But what happened to one New York City resident is a horror story only Steven King is capable of thinking up. 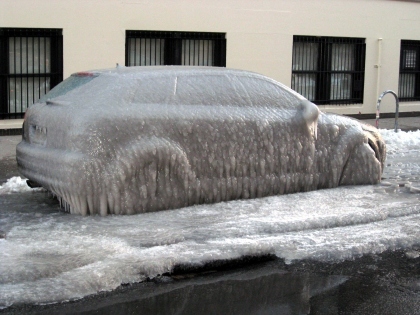 Pete, the owner of an Audi A3, discovered his car with six inches of ice packed on one side. He is taking the situation in stride and being thankful that it was just his car that was covered in ice. The ice formed after a leaky pipe caused a sinkhole in the pavement forcing water to bubble up and freeze over as reported by the DEP. The removal process required more than your everyday ice scraper and a good defrost system. Even a hammer and screwdriver were no match for the ice which was hard as concrete. Even after work with a backhoe the car tires were still frozen to the ground. After Pete was finally able to get into the car and start the engine the rear window shattered due to the inside heat of the car and the outside temperatures.